With a bit more grip and durability than the World Cup race formula, the red Evo skins from Ski Trab still pack some serious glide. Made with 100% mohair, the skin material is the same as that used in the precut skins for Trab’s aramid-core skis. 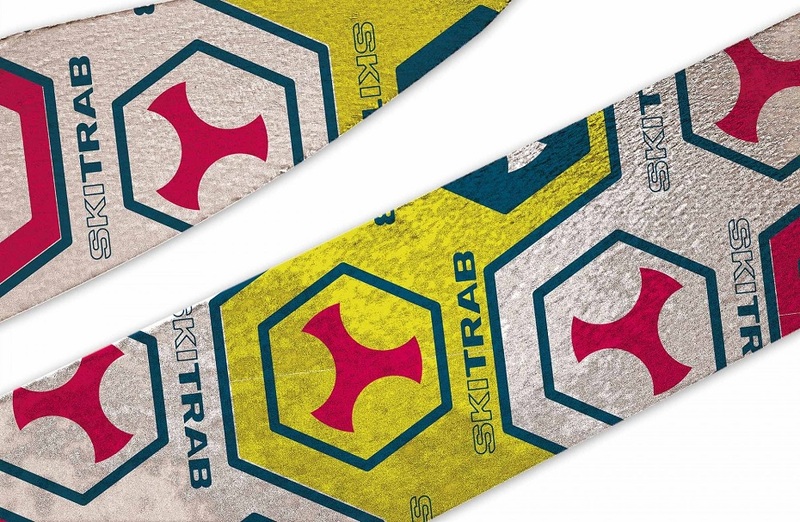 Combined with some Attivo skin tips, you can assemble some skins for just about any Trab ski. Or with different hardware, just about any other ski can be kitted affordably as well. There are now fewer excuses for not using the speed offered by 100% mohair. Using efficient technique, you will be rewarded with every slide-step. I bought these off a roll and cut them for 80mm skis for ski mountaineering. I set them up with the Colltex tip attachments (no heel attachment) and works super well. The skins are reasonably fast. Used them about 30 days now and I am happy. Good value for the price. what is the thickness measurement of these skins, and what is the thickness of the World Cup Race Formula skins? The thickness of this skin, measured with calipers, is 1.56mm. The thickness of the WC Race skins, measured the same way is 1.29mm. do these skins have an adhesive backing already on them? Hello, yes these skin materials come with a hot-melt style adhesive already on them. What is the width of these skins? Hi Pierre, this material is available in several widths from 85mm to 115mm. See my review for more details on the Precut version that I have for my Magico skis. But in brief, I've previously used other 100% mohair skins from Atomic, Black Diamond, CAMP, Colltex, Dynafit, plus Trab's mohair version designed for racing. I've also used momix skins from Black Diamond, Colltex, Dynafit, and Trab. Trab claims that this touring version of its mohair skin has better grip than its own race mohair. Hard to tell without a side-by-side comparison with identically cut skins, but the grip has seemed perfectly fine to me, on a pair with any other momix skin. And glide is of course excellent. Trab does acknowledge that durability is compromised relative to a momix skin. I haven't noticed any wear on the plush so far, but then again I've used them only on winter snow that hasn't been very abrasive. Skin glue is relatively light but has performed well. So overall, Five Stars for a really cheap way to get a really high-end 100% mohair climbing skin for your winter touring ski setup. Hi Rick, these are sold by the centimeter, so enter a quantity for the length you desire. Thanks Matt, the skin off the rolls is sold per centimeter, so you'd need 320cm to get two 160cm lengths. The "everything sold in pairs" was applicable only to the listing on which you read it.